"Vienna Rolls: Just the thing for the newcomer in the community to take to a church supper. Fame will follow her." 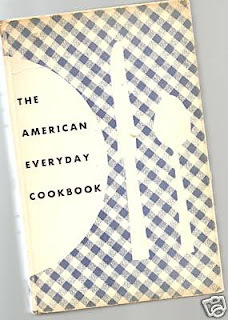 --taken from The American Everyday Cookbook, 1955. Well, too bad I didn't read that a few weeks ago! Here I thought I'd have to go get red and purple streaks put in my hair to make a memorable impression at the new church we recently joined. If only I'd read this recipe note first, I could have saved myself a good $200 or so!! My mom passed this cookbook down to me just a couple months before I was married in 1998. It belonged to her mother, Betty, who received it from her husband, George, in 1955. This baby has been well-used, believe me! I got a wild hair (no, no puns here...) tonight to browse through it as I hadn't opened it up for several years. Both my grandmother and my mom had written little notes throughout---births, deaths, divorces...x's by things that were good. On an inconspicuous spot on one of the first few pages, I found a little note: "Betty + George". I couldn't help but add to the page my own little note for generations to come: "Sarah + Jamie". At least your hair is not purple! I am sure you are making a great impression on the new church just by being who you are. There are wonderful people there- and I am sure they would wolf up the rolls too. That cookbook sounds priceless, thanks for sharing about it.